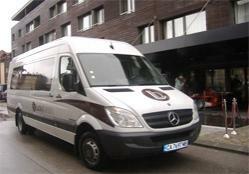 Lucky Bansko PA & RelaxAparthotel offers its guests free transfers in the summer to the city center of Bansko and back. Transfers to the city center (parking in Bansko municipality) are made with luxurious Mercedesbuses every day from 6 PM to9 PMand in the opposite direction – from8 PM to 10 PM. All transfers are made on a preliminary request for a specific hour which guests can make at the hotel reception or on 0887 910 971. In case of a delay of more than 5 minutes after the requested hour, the transfer request is canceled.